The Pokémon may heal its own status problems. X A steel-hard shell protects its tender body. It quietly endures hardships while awaiting evolution. X Der stahlharte Panzer schützt seinen zarten Körper. Es wartet geduldig auf seine Entwicklung. X Son corps frêle est protégé par sa carapace d’acier. Il encaisse les coups durs en attendant d’évoluer. X Su frágil cuerpo está recubierto de una coraza dura como el acero. Permanece quieto en su desarrollo. X Ha una corazza dura come l’acciaio che protegge il suo fragile corpo. Attende immobile di evolversi. X 강철같이 단단한 껍질로 부드러운 몸을 보호하고 있다. 진화할 때까지 가만히 참고 있다. Y This Pokémon is vulnerable to attack while its shell is soft, exposing its weak and tender body. Y Während der Panzer dieses Pokémon sehr weich ist, bietet er keinen großen Schutz vor Attacken. Y Il est vulnérable aux attaques tant que sa carapace est molle, car il expose son corps tendre et mou. Y Este Pokémon es vulnerable al ataque cuando su coraza es blanda y no lo protege del todo. Y Quando la sua corazza è morbida, il corpo fragile di questo Pokémon è più vulnerabile agli attacchi. Y 껍질이 단단해지기 전에 강한 충격을 받으면 속이 나와버리니 주의. Omega Ruby The shell covering this Pokémon’s body is as hard as an iron slab. Metapod does not move very much. It stays still because it is preparing its soft innards for evolution inside the hard shell. Omega Ruby Der Panzer dieses Pokémon ist hart wie Stahl. Safcon bewegt sich kaum, da es das weiche Innere unter seiner harten Schale auf seine Entwicklung vorbereitet. Omega Ruby La carapace protégeant ce Pokémon est dure comme du métal. Chrysacier ne bouge pas beaucoup. Il reste immobile pour préparer les organes à l’intérieur de sa carapace en vue d’une évolution future. Omega Ruby La capa que recubre el cuerpo de este Pokémon es tan dura como una plancha de hierro. Metapod apenas se mueve. Permanece inmóvil para que las vísceras evolucionen dentro de la coraza que le rodea. Omega Ruby La corazza di questo Pokémon è dura come una lastra di ferro. Metapod non si muove molto. Sta immobile per preparare il morbido interno della dura corazza all’evoluzione. Omega Ruby 몸의 껍질은 철판처럼 단단하다. 움직임이 적은 것은 껍질 안에서 부드러운 몸이 진화 준비를 하고 있어서다. Alpha Sapphire The shell covering this Pokémon’s body is as hard as an iron slab. Metapod does not move very much. It stays still because it is preparing its soft innards for evolution inside the hard shell. Alpha Sapphire Der Panzer dieses Pokémon ist hart wie Stahl. Safcon bewegt sich kaum, da es das weiche Innere unter seiner harten Schale auf seine Entwicklung vorbereitet. Alpha Sapphire La carapace protégeant ce Pokémon est dure comme du métal. Chrysacier ne bouge pas beaucoup. Il reste immobile pour préparer les organes à l’intérieur de sa carapace en vue d’une évolution future. Alpha Sapphire La capa que recubre el cuerpo de este Pokémon es tan dura como una plancha de hierro. Metapod apenas se mueve. Permanece inmóvil para que las vísceras evolucionen dentro de la coraza que le rodea. Alpha Sapphire La corazza di questo Pokémon è dura come una lastra di ferro. 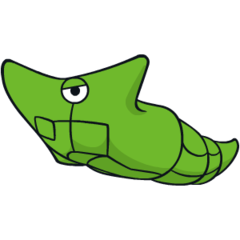 Metapod non si muove molto. Sta immobile per preparare il morbido interno della dura corazza all’evoluzione. Alpha Sapphire 몸의 껍질은 철판처럼 단단하다. 움직임이 적은 것은 껍질 안에서 부드러운 몸이 진화 준비를 하고 있어서다. Sun Its shell is filled with its soft innards. It doesn’t move much because of the risk it might carelessly spill its innards out. Moon Its shell is hard, but it’s still just a bug shell. It’s been known to break, so intense battles with it should be avoided. Red This Pokemon is vulnerable to attack while its shell is soft, exposing its weak and tender body. Blue This Pokemon is vulnerable to attack while its shell is soft, exposing its weak and tender body. Yellow Hardens its shell to protect itself. However, a large impact may cause it to pop out of its shell. Stadium When it hardens, only the external shell is transformed. The inside remains tender. Gold Inside the shell, it is soft and weak as it prepares to evolve. It stays motionless in the shell. Silver It prepares for evolution by hardening its shell as much as possible to protect its soft body. Crystal This is its pre-eveolved form. At this stage, it can only harden, so it remains motionless to avoid attack. Stadium2 Inside the shell, it is soft and weak as it prepares to evolve. It stays motionless in the shell. Ruby The shell covering this Pokemon's body is as hard as an iron slab. Metapod does not move very much. It stays still because it is preparing its soft innards for evolution inside the hard shell. Sapphire The shell covering this POKeMON's body is as hard as an iron slab. METAPOD does not move very much. It stays still because it is preparing its soft innards for evolution inside the hard shell. Emerald Its shell is as hard as an iron slab. 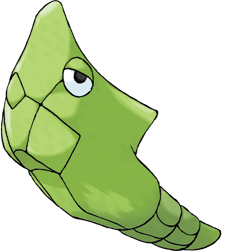 A METAPOD does not move very much because it is preparing its soft innards for evolution inside the shell. Pearl A steel-hard shell protects its tender body. It quietly endures hardships while awaiting evolution. Platinum A steel-hard shell protects its tender body. It quietly endures hardships while awaiting evolution. Black A steel-hard shell protects its tender body. It quietly endures hardships while awaiting evolution. White A steel-hard shell protects its tender body. It quietly endures hardships while awaiting evolution. White 2 A steel-hard shell protects its tender body. It quietly endures hardships while awaiting evolution.